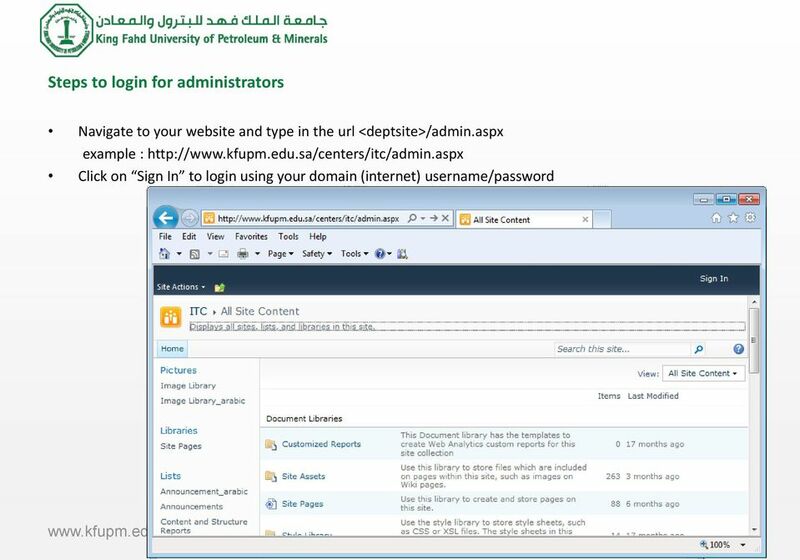 Download "KFUPM. 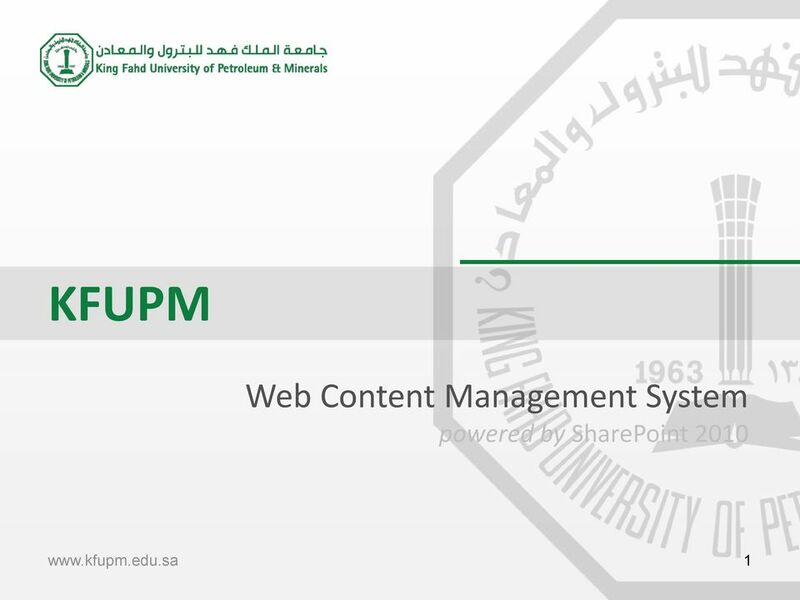 Web Content Management System powered by SharePoint 2010. www.kfupm.edu.sa 1"
5 This option allows the Site Owner to manage the banner which appears on the Site Home Page. Users can modify the banner at any point of time. 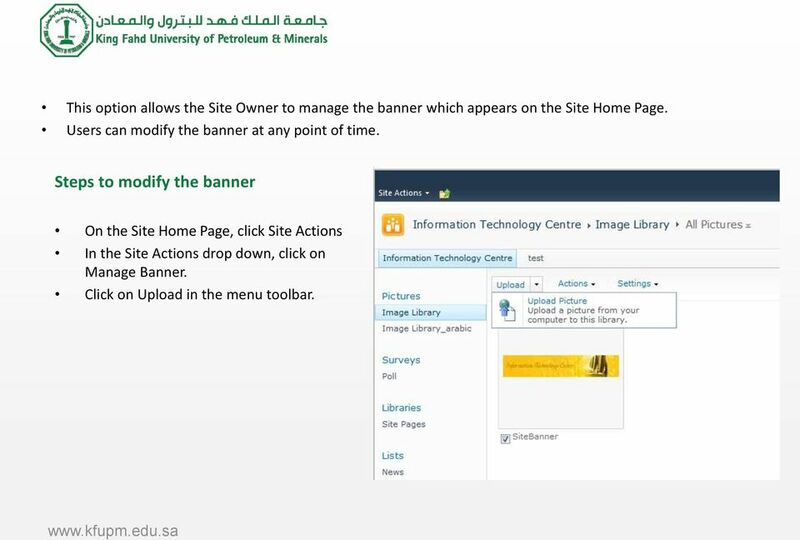 Steps to modify the banner On the Site Home Page, click Site Actions In the Site Actions drop down, click on Manage Banner. Click on Upload in the menu toolbar. 6 Manage Banner It will launch a popup window. Select the required image file from your computer or a network drive. 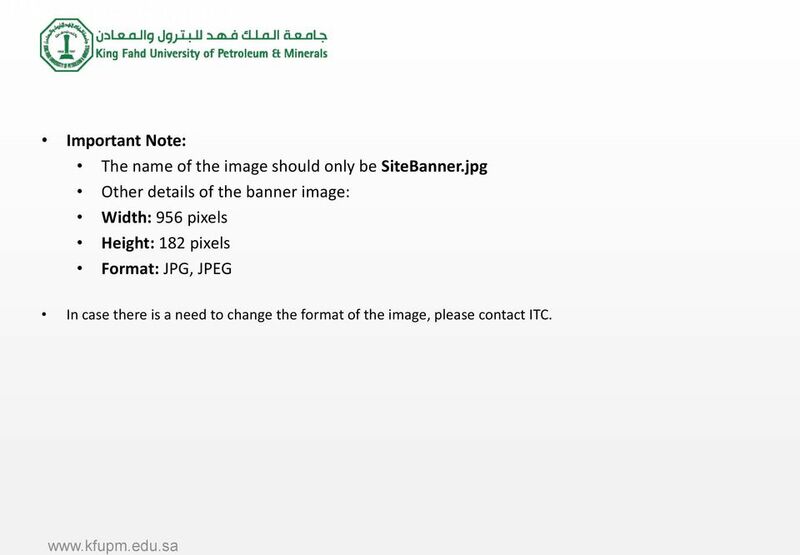 Select the option Overwrite existing files to overwrite the existing default banner. Click Ok. Once the image is uploaded, it will ask to fill in other details. No need to change anything over here. Click Ok to continue. The image has been updated. Refresh the Site Home Page to view the changes. 7 Manage Banner Important Note: The name of the image should only be SiteBanner.jpg Other details of the banner image: Width: 956 pixels Height: 182 pixels Format: JPG, JPEG In case there is a need to change the format of the image, please contact ITC. 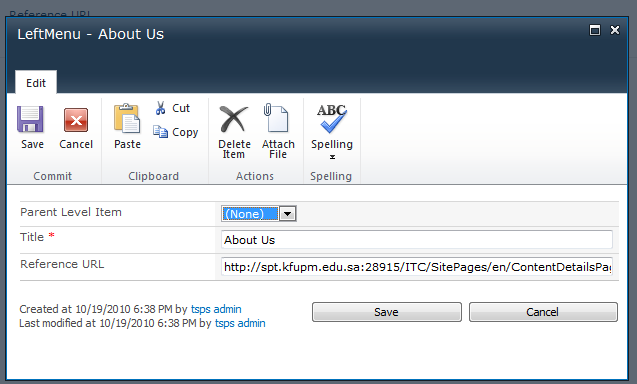 8 Manage Menu This option allows the Site Owner to add, edit and delete the Menu of the site. Users can manage the menu items at any point of time. 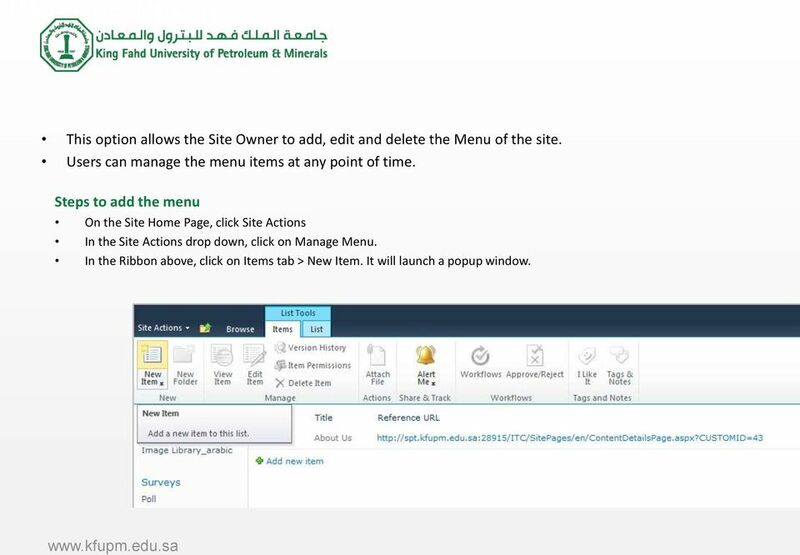 Steps to add the menu On the Site Home Page, click Site Actions In the Site Actions drop down, click on Manage Menu. In the Ribbon above, click on Items tab > New Item. It will launch a popup window. 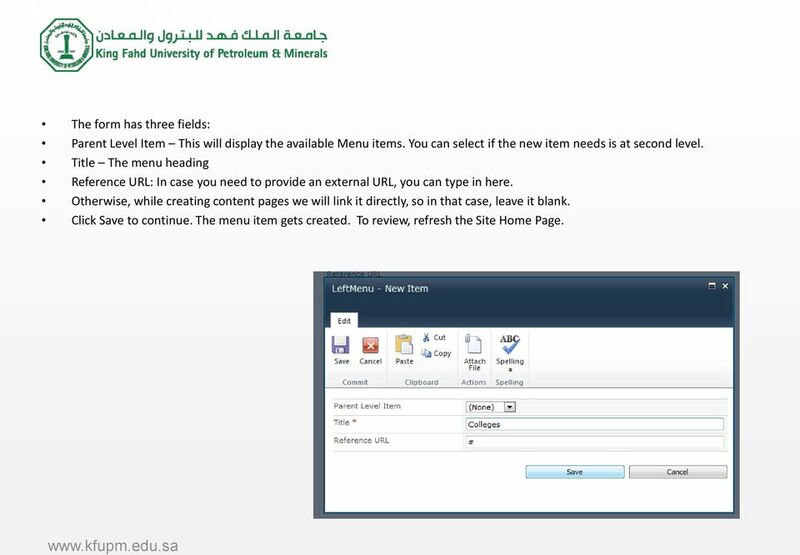 9 Manage Menu The form has three fields: Parent Level Item This will display the available Menu items. You can select if the new item needs is at second level. Title The menu heading Reference URL: In case you need to provide an external URL, you can type in here. Otherwise, while creating content pages we will link it directly, so in that case, leave it blank. 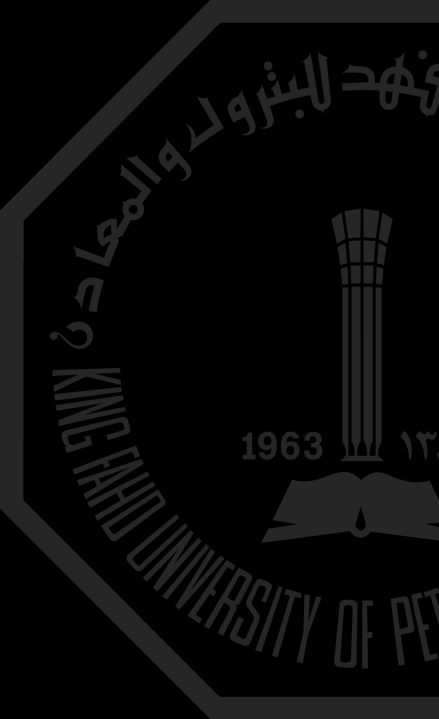 Click Save to continue. The menu item gets created. To review, refresh the Site Home Page. 10 Manage Menu Steps to edit the menu On the Site Home Page, click Site Actions In the Site Actions drop down, click on Manage Menu. Against the item, click on Edit icon, It will launch a popup window. 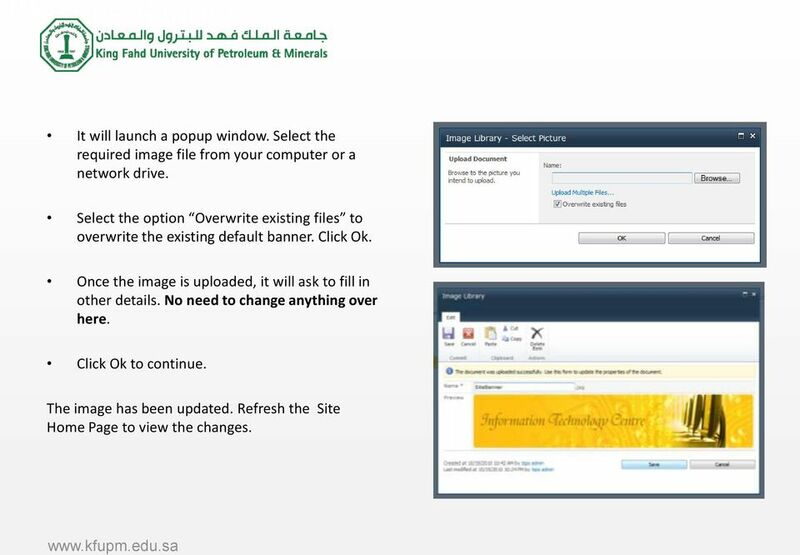 11 Manage Menu Update the content and click on save to continue. The menu item gets created. To review, refresh the Site Home Page. 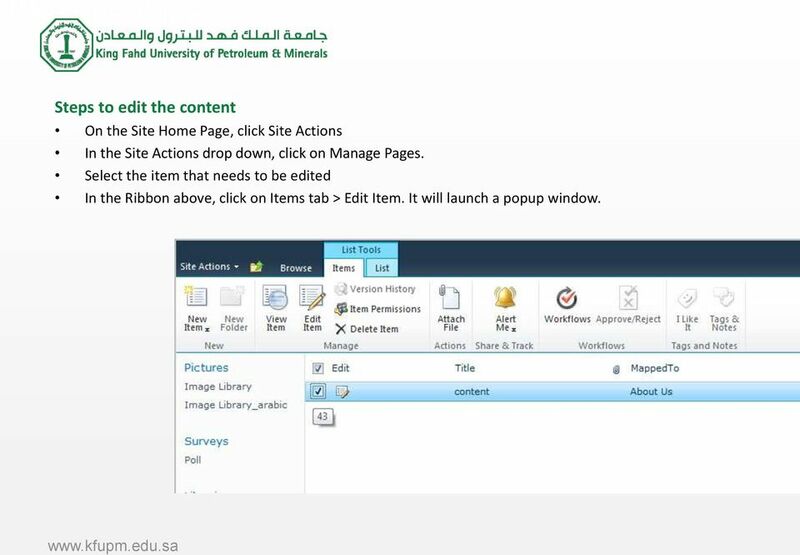 12 Manage Menu Steps to delete the menu On the Site Home Page, click Site Actions In the Site Actions drop down, click on Manage Menu. In the Ribbon above, click on Items tab > Delete Item. It will delete the menu item. 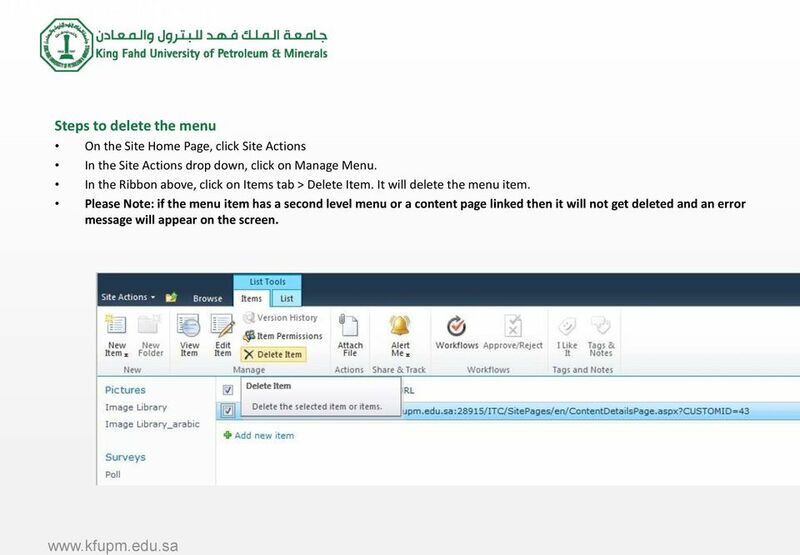 Please Note: if the menu item has a second level menu or a content page linked then it will not get deleted and an error message will appear on the screen. 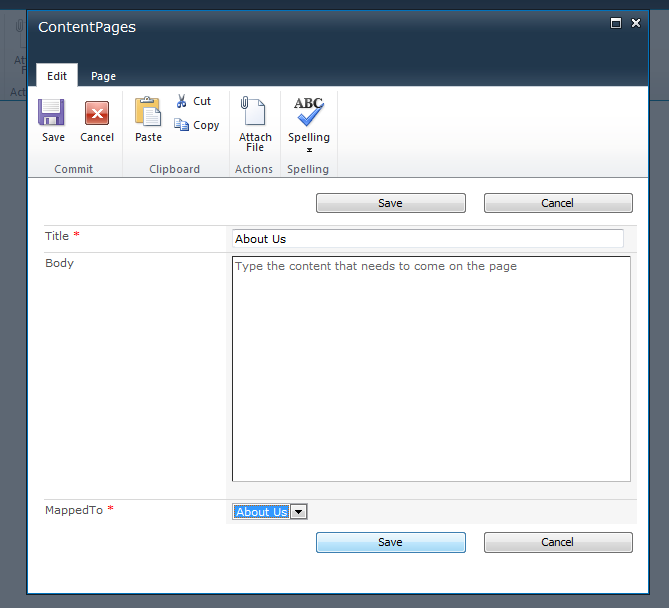 13 Manage Pages This option allows the Site Owner to add, edit and delete the content on the site. 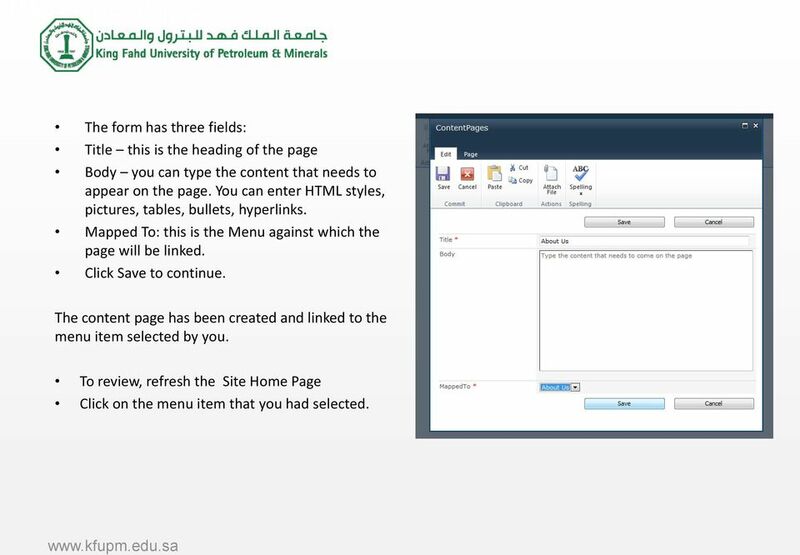 It also allows to link the content page to the menu on the site. 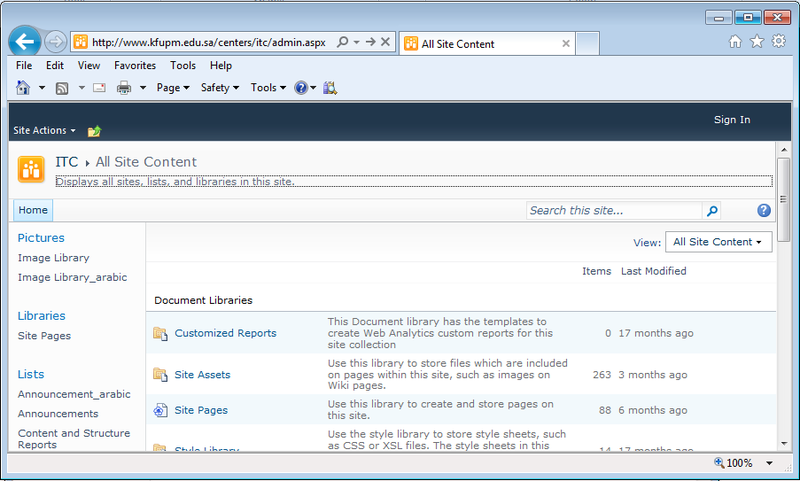 Steps to add the content On the Site Home Page, click Site Actions In the Site Actions drop down, click on Manage Pages. In the Ribbon above, click on Items tab > New Item. It will launch a popup window. 14 Manage Pages The form has three fields: Title this is the heading of the page Body you can type the content that needs to appear on the page. You can enter HTML styles, pictures, tables, bullets, hyperlinks. Mapped To: this is the Menu against which the page will be linked. Click Save to continue. The content page has been created and linked to the menu item selected by you. 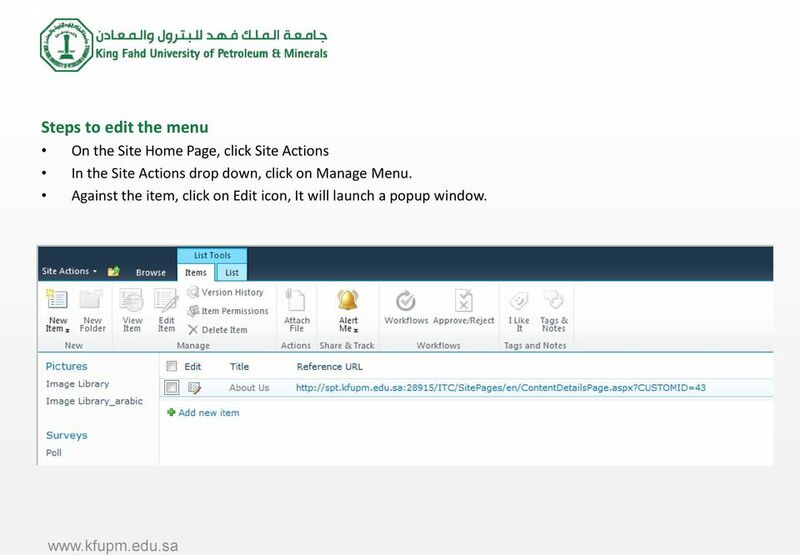 To review, refresh the Site Home Page Click on the menu item that you had selected. 15 Manage Pages Steps to edit the content On the Site Home Page, click Site Actions In the Site Actions drop down, click on Manage Pages. 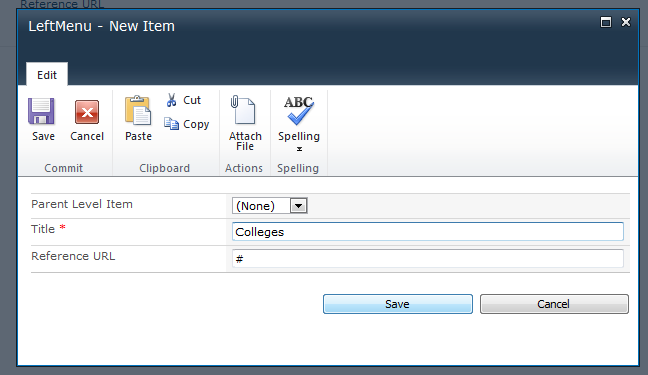 Select the item that needs to be edited In the Ribbon above, click on Items tab > Edit Item. It will launch a popup window. 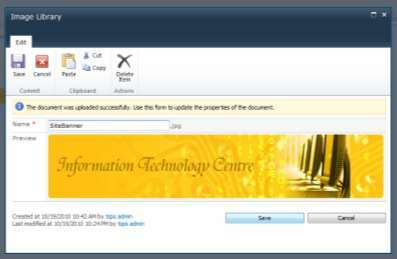 16 Manage Pages Update the content required and click Save to continue. The content page has been updated and linked to the menu item selected by you. 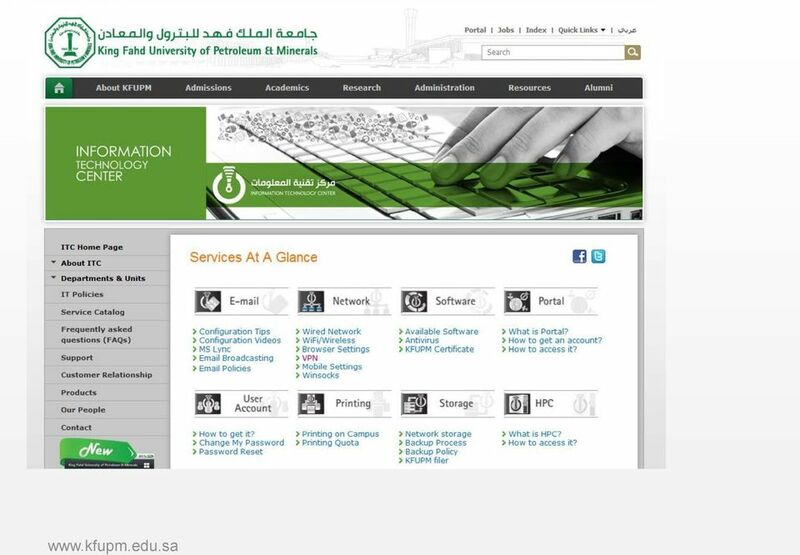 To review, refresh the Site Home Page Click on the menu item of the content page. 17 Manage Pages Steps to delete the content On the Site Home Page, click Site Actions In the Site Actions drop down, click on Manage Pages. 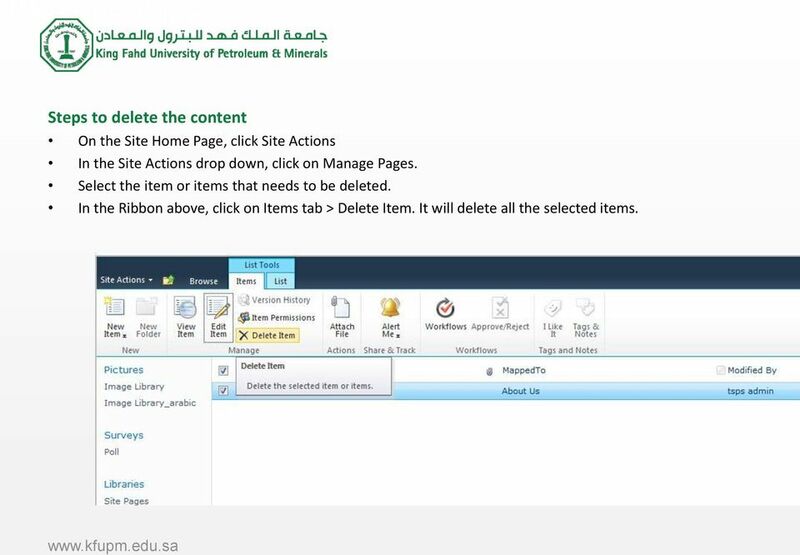 Select the item or items that needs to be deleted. In the Ribbon above, click on Items tab > Delete Item. It will delete all the selected items. 1. After installing you can launch the program by clicking on the Start button and then select Programs, then WS_FTP LE, and then WS_FTP LE. Tyler Dashboard. User Guide Version 6.2. For more information, visit www.tylertech.com.